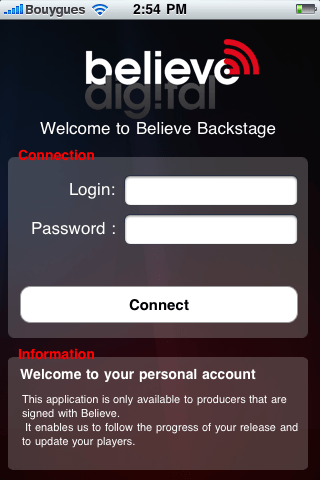 The new Believe Backstage app is now available! The Believe Backstage app has been temporarily discontinued, but we are working to developing another version that will be more efficient and better serve your needs. Over the past 6 months we’ve added many new tools and statistics to Believe Backstage, allowing our artists and labels to make the most of new internet technologies to optimise digital marketing strategies, and, ultimately, increase sales. Well now, you can do this on the move with the new Believe Backstage iPhone app! From your phone, you will now be able to track your sales in real time, from iTunes and more than 7 other services, update your promotional tools (BelieveBand, widget, Facebook and MySpace apps) and more, all from anywhere you have an Internet connection! You will also be able to keep up to date with all the latest news from Believe Digital thanks to integration with our blog, follow the progress of your distribution in various territories and stores and more. But that’s not all, perhaps the most exciting new aspect of the app, is that you can provide access to your artists to update their own promotional content directly to their players! This is a fantastic tool when an artist is on tour or wants to post news updates without access to a computer. 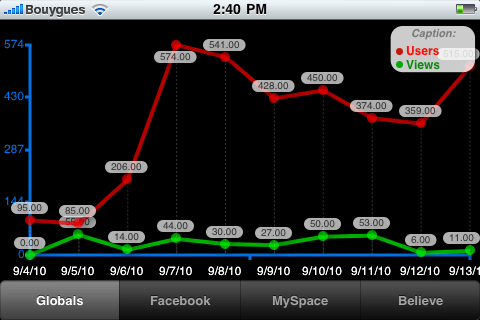 Artists will be able to upload photos, news stories, new gig ages and more, all directly from their iPhone!